Like their namesake, the Tippett Quartet draws inspiration from the past and future alike. It is committed to combining mainstream repertoire with contemporary works, and has been described as “bold and innovative…extraordinary technical accomplishment with flair and a bright communicative spark” (The Times). Its recent Wigmore Hall recital was greeted with universal critical acclaim for a programme of Haydn, Schubert and Ravel. 2009 saw the release of four new CDs including volume two of the complete Tippett string quartets for NAXOS. The quartet also took part in Peter Maxwell Davies’s birthday celebrations at London’s Southbank. 2010 sees the release of three new CDs including the world premiere recording of Richard Arnell’s String Quartets and Donald Tovey’s works for String Quartet. The latter CD was launched at the English Music Festival in May. The Tippett Quartet was formed in 1998, the year in which it made its Wigmore Hall debut. They have since performed at the BBC Proms, Cheltenham Festival, Three Choirs Festival, Chichester Festivities, Dartington International Summer School and Lincoln International Festival. 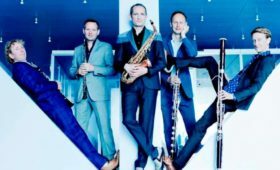 They have also performed at King’s Place, Purcell Room, Queen Elizabeth Hall, Bridgewater Hall, The Sage, Gateshead and regularly return to Wigmore Hall. The quartet frequently appears on BBC Radio 3 and has broadcast live performances on Radio Novi Sad, Serbia and Sveriges Radio (Swedish National Radio). The Tippett Quartet combines clarity of execution and total commitment in its performances; its interpretations are stylistically varied, informed by the breadth of its repertoire. 2007 saw the start of a two-year project to record the complete Tippett string quartets for NAXOS. 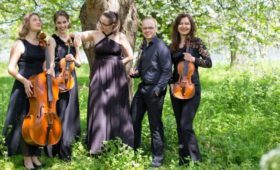 The quartet’s artistic approach makes it highly suited to the virtuosic demands of this repertoire as described in The Times: “their intent is serious, their execution compelling, their ensemble immaculate”. 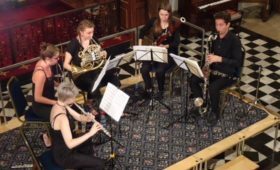 The quartet has premiered works by composers including John Adams, Cecilia Ore, Simon Holt, Robert Walker, Howard Goodall and Stephen Dodgson. Its relationship with Stephen Dodgson has led to the release of his complete string quartet chamber music for Dutton Epoch. The Tippett Quartet has released recordings for EMI Classics and for Peter Gabriel’s Real World label. It has performed at the Royal Opera House collaborating with the Royal Ballet and had invitations to perform in France and the USA. It has collaborated with artists such as Lawrence Power, David Owen Norris, Melvyn Tan, Ashley Wass and Craig Ogden. The quartet pursues a keen interest in its educational work and regularly visits schools and Universities. N.B. Stephen Dodgson, whose seventh String Quartet is being played at this concert, is a Patron of Richmond Concert Society.